If you're searching for a game that's fun enough to keep you entertained while the president elections are still running, we have a perfect game for you - your very own chance to become the one and only trump frontrunner. Trump, Dump, Punch - Jump is a game that will challenge you to the fullest and will have your attention glued to your phone. Amazing graphics with simple controls, it will totally get you hooked. 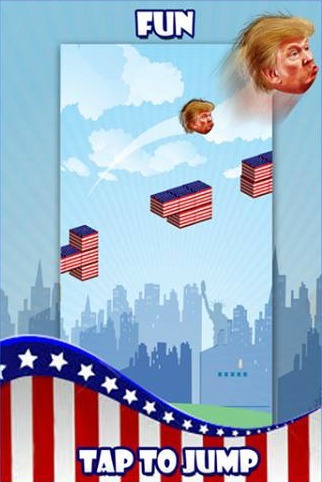 Trump, Dump, Punch - Jump has a very cool and interesting gameplay features which you may think are easy at first but the real challenge is yet to be experienced. Your goal of the game is to keep moving forward through the city all the way from the Donald Real Estate Empire down to the Trump Towers. The game is quite easy to play but the hard thing is to keep your punch power for the long run. Avoid the obstacles by staying on the block and avoid them to score higher. Keep an eye on the changing and moving blocks if you want to reach your goal faster. A new game, a new challenge to keep you entertained during the elections. Download it now for free from Google Play.